During the Tuesday, July 25th Council Meeting, Mayor Rusty Bailey announced the resignation of Council Member John Burnard from the City Council. 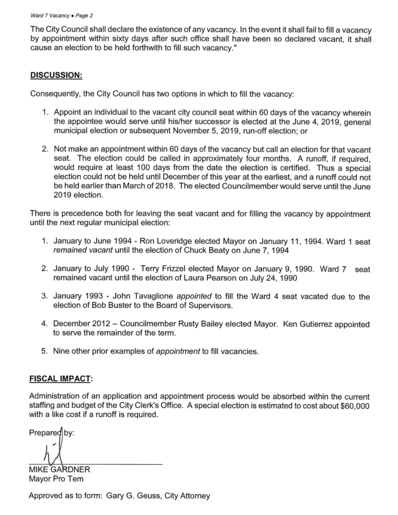 Residents of the 7th Ward should know the city is committed to ensuring you have responsive representation until a new Council person is seated. 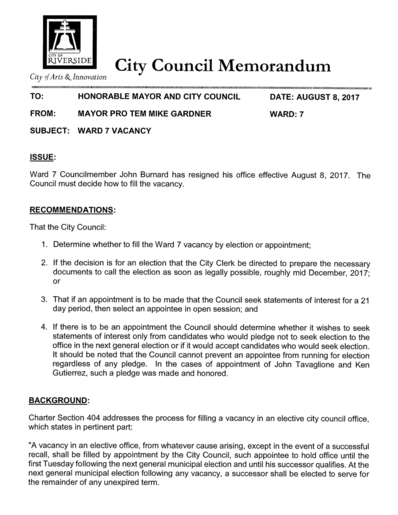 In the interim, Sandy Garcia- who has served the residents of Ward 7 as the Council Assistant, will continue to be a point of contact for any concerns pertaining to Ward 7. She can be reached at (951) 826-5024 or via email at sgarcia@riversideca.gov. Council Member Jim Perry and Mayor Rusty Bailey have also agreed to support Ward 7 during the transition. For more information or to voice your concerns, please attend the Council Meeting on Tuesday, August 8th. The item will be discussed in the evening session beginning at 6:30 pm. If you are unable to attend but would like to share your thoughts please email our City Clerk Colleen Nicols at city_clerk@riversideca.gov or Council Member Jim Perry at jperry@riversideca.gov. Thank you to Ward 7 Board of Ethics member Wendell Tucker for providing a brief overview of the Board of Ethics. The Board of Ethics convenes, as needed, to hear complaints filed under the thirteen prohibited behaviors of the Code of Ethics and Conduct. The purpose of the Board of Ethics is to advise and make recommendations to the City Council on matters pertaining to the adoption, revision, administration and enforcement of the Code of Ethics and Conduct. For more information on the Board of Ethics please visit: http://www.riversideca.gov/city_clerk/commissions-Board-of-Ethics.asp. Assembly Member Sabrina Cervantes who represents the 60th Assembly District was present at the meeting and introduced herself to the community. The 60th district includes the communities of Corona, Eastvale, Jurupa Valley, Norco and Riverside. During the Assembly’s summer recess, Assembly Member Cervantes would like the opportunity to meet with constituents. To schedule a meeting please contact the Assembly Member’s office at (951) 371-6860. Council Member Jim Perry provided an overview of the recently formed Ward Action Teams. The Ward Action Teams consist of various city departments such as Code Enforcement, Riverside Police Department, City Attorney’s Office, City Manager’s Office and the Council Member for each ward to name a few. The purpose of the team is to work together to solve neighborhood issues and improve our quality of life. The team meets on a monthly basis and staff discusses progress that is being made as well as actions that took place to resolve the matter. Thank you to Community and Economic Development Department staff for providing an overview of the housing element and rezoning program. The Housing Element identifies and analyzes the existing and projected housing needs, and articulates the City’s official policies for the preservation, conservation, improvement, and production of housing within the City. It examines the City’s housing needs, as they exist today, and projects future housing needs. The state mandates housing element updates in an 8-year cycle where the purpose is to identify existing and projected housing needs for individuals at all income levels. The update must be approved by the California Department of Housing and Community Development and the mandate requires there be all kinds of housing such as low-income, moderate income and affordable to above-moderate income homes. Under the current mandate it is required we reach 4,767 units citywide. The criteria states there must be available zoning areas for development however actual development is not required. As a result of a settlement agreement, the terms state by the end of 2017, the rezone program must be completed. In an effort to meet this requirement, our Community and Economic Development department has identified 69 candidate rezoning sites (303 parcels) which will help meet the required number. The rezoning program does not use eminent domain to acquire properties, does not require the demolition of existing buildings or the closing of existing businesses and does not mandate that affordable units be constructed on the site. At this point, no decisions have been made or finalized. The rezoning program does provide for opportunities to develop a variety of multi-family housing types and it will bring the city into compliance with State Law and Court Ordered Settlement Agreements. For more information about the housing element and rezoning program I encourage you to attend an upcoming Planning Commission hearing where the matter will be discussed in detail. 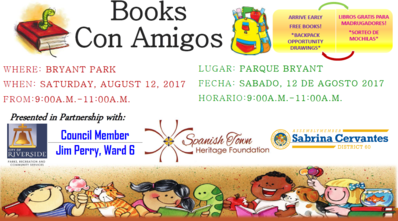 The first meeting will be held on Thursday, August 10th at 9:00 am at the Council Chambers. The Planning Commission will discuss this item for a second time on September 14th at 6:00 pm at the Council Chambers. The City Council will discuss this item in October and December. Update your subscriptions, modify your password or e-mail address, or stop subscriptions at any time on the Subscriber Preferences Page. You will need to use your e-mail address to log in. If you have any questions or problems with the subscription service e-mail subscriberhelp.govdelivery.com for assistance. 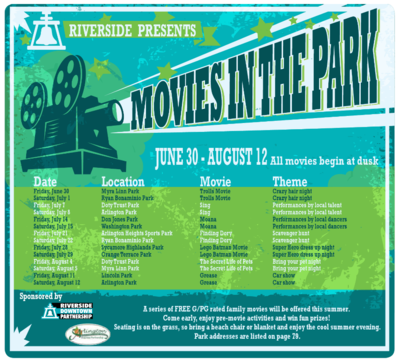 This service is provided to you at no charge by City of Riverside. 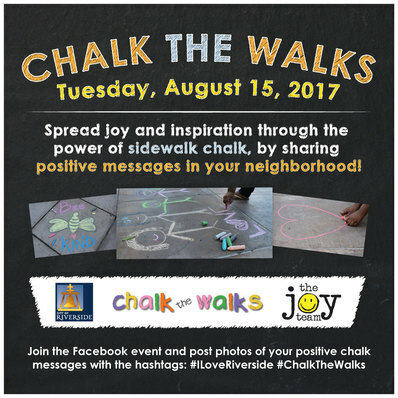 Visit us on the web at http://www.riversideca.gov/.